Join us for good food, good music, good friends and a good time at Hlubik Farms, Chesterfield, NJ in support of Farmers Against Hunger! 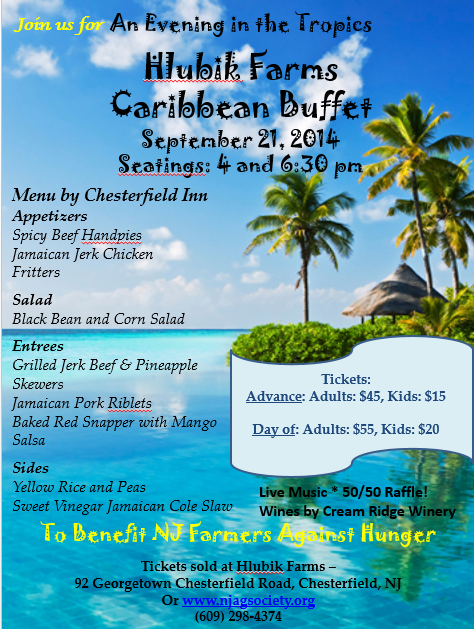 On Sunday September 21st, 2014, Hlubik Farms will be hosting a Caribbean Buffet prepared by the Chesterfield Inn. Cream Ridge Winery will also be serving up delicious wine and the steel drum band will add to the ambiance as you enjoy dinner on the farm! Proceeds benefit Farmers Against Hunger. Hlubik Farms is located at 92 Georgetown-Chesterfield Road, Chesterfield, NJ in Burlington County. Call Hlubik Farms (609) 298-4374 or Farmers Against Hunger (Kristina Guttadora) (609) 462-9691 for information.